Discussion in 'Weapons and Tactics' started by Hankooks, Jul 30, 2016. With all the craziness these days with police shootings and stuff I started carrying my old Egyptian AK in my truck and have been keeping it by my desk at work. Just been looking around for info on the AK in general and came across this video. Had it on in the background during tonight's prelims and found it very interesting. If you have 45 minutes check it out. The history of that rifle is amazing and the fact it's still going strong almost 70 years later with very little in the way of modifications is impressive. Never bought an AK. Got one of these instead. Stock piles of every/any thing we can get our hands on,I'll never forgot we had 2 twin .444 lever action Marlins. thats a 5.56 version of the MAK though. not 7.62 soviet. 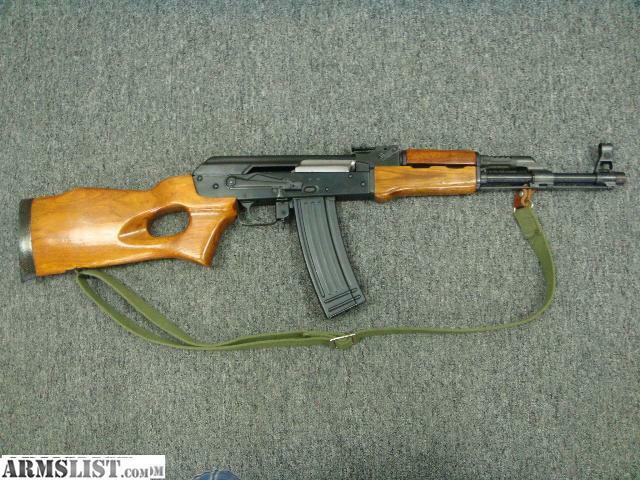 Where do you work that your boss is down with you having an AK at your desk? That is an awesome boss. I'm honestly thinking of getting a trunk safe and putting in a rifle or shotty due to all the madness going on. I have a Saiga Sporter and love it. Tempted to get another one and do a full AK build on it, then register it as an AW in January to have full size mags and no AK version of a bullet button. Hankooks and Gregolian like this. I work at a dealership and yeah he's a cool dude. I've actually got a 10 rifle safe in my office. I keep my 1978 colt ar, a .223 ak, couple shotguns, and a .357 smith snubby in there for a backup pistol. I carry a G19 on me. He was skeptical at first, especially about me carrying but we had a guy come in once that was acting real strange. Claimed that someone here had killed his gf and he was looking for them. Had all the office girls and sissies pretty nervous. I loaned out the 19, the .357, and a Taurus 22 revolver I happened to have here to some of the other guys and grabbed the ak. We went up front and spread out in some of the offices surrounding him in case he pulled a weapon. He didn't know we were there. One of the finance guys knew the dude fairly well and talked him down and got him to leave. He was a normal guy but something with his meds had went wrong apparently. After that I had his full support lol. Now I keep a bunch of mags for each gun and bandoliers of buckshot in here too. There's at least 7 maybe 8 guys here that have their ccws now. Pretty safe place to work. Sorry bout the long post. Cubo de Sangre, Gregolian and Protectandserve like this. Can I come work with you even though I have no experience.